I’ve always had a love-hate relationship with my hair. It’s always been a bit lifeless. Over the years I’ve found some products and ways of styling that help give it that extra bit of ‘oomph’ that I’m after. The first is in the washing! I always try to reach for a volumising shampoo, one of my faves brands being Aussie. I used to find skipping conditioning my hair helped with volume, but now my hair is coloured this is a step I really can’t miss! Instead, I try to focus the conditioner on my ends, avoiding my roots as much as I can! Next is the blow dry, I feel an investment in a really good hairdryer is so important, such as the Panasonic Hair Dryer. It’s so important to find a hairdryer that leaves your hair shiny, as opposed to dry and static. When drying, I like to tip my head upside down and dry the roots first, trying to lift them as much as possible. I haven’t quite mastered the whole ‘brush in one hand dryer in the other’ that every hairdresser seems to do so well yet, but if you’re as talented as that, you should totally go for it, as it’ll add that little more volume you need! Onto styling, I like to use my trusty Tangle Teezer to give my hair a brush through. 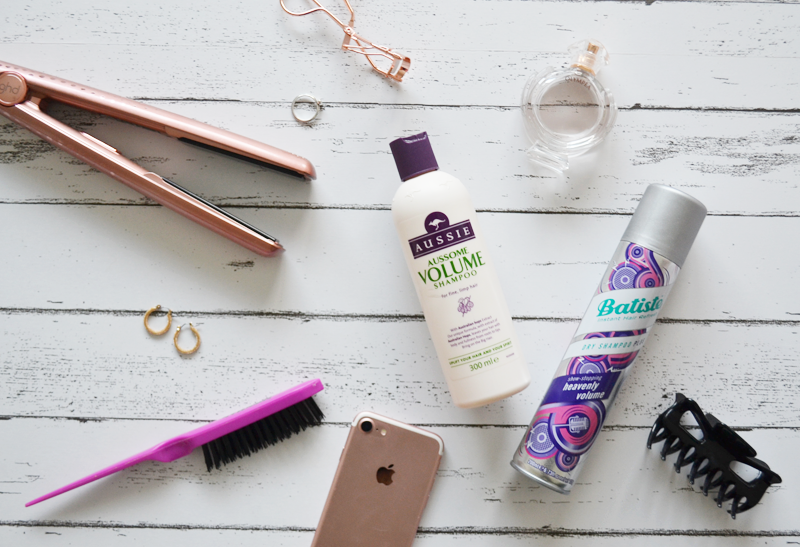 Then I use my all time favourite product ever – Batiste’s Stylist XXL Volume Spray (see my review here). I try to avoid using this in freshly washed hair because of the way it can make my hair feel, but if for any particular reason I really want some extra volume after a wash, I will use it sometimes. Spray this into your roots and it does wonders!! To add any more oomph in more specific areas, I’ll use my styling brush to backcomb any areas. Finish it with some hairspray and hopefully you’re good to go! "Cosy Night In: The Essentials"